We want to hear what you have to say on the matter. Which option is the best fit for a new Central Library. If none of these options is appealing, please let us know a suitable alternative. Please click here to send us a message with your preferred option. 14 Responses to "Tell Us Where To Go!" 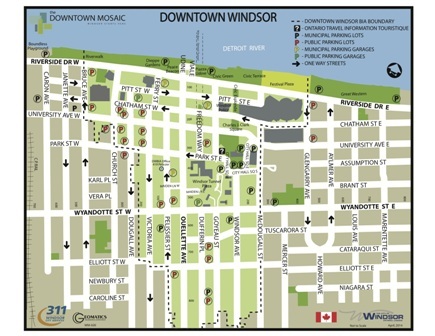 I am in support of relocating the new central branch of the Windsor Public Library along the Ouellette Ave. corridor, in the centre of downtown Windsor. In particular I would like to suggest the north-west corner of Ouellette Ave. and Wyandotte St., as a new build on the two parking lots that currently occupy that site (i.e., infill development). I envision the new building as an « anchor » on this prominent downtown intersection, as it wraps around, and rises above, the existing Tessonics building and fronts on each of Ouellette Ave, Wyandotte St., and Pelissier St! This location would provide maximum exposure and access to residents and would bring life to a very important downtown intersection that already holds great potential. I agree with these other posters, especially Sheryl Davies. A problem with Gregory Heil’s comment is that the Mission Board is very stubborn in their plans, as is Mr. Ron Dunn. It will be very difficult if not impossible to reverse what has been done which is what Gregory is suggesting. I would move the library to the corner of McDougal and Tecumseh There is a large unused medical building next to Goodwill. Next build the library on Riverside Drive next to the Art Gallery. Put the archives right now into the Chimchuk/Art Gallery top floor of that building. Administration can go into any office space available downtown. OUELLETTE CORRIDOR -NOT FAR FROM THE PRESENT LOCATION. MUST BE ON A BUS ROUTE. There are two public schools in the area of the current library location. It would be a travesty to move it to the Art Gallery location or to the Adventure Bay area, which would facilitate, the children walking well into a city centre that wouldn’t be compatible with their age, or ability to deal with the downtown core and its norms. There is a lot at Elliot and Goyeau streets, another at Elliot and Ouellette and, the HMCS Hunter building is now for sale. It is imperative that the facility be as near to where it is currently located, for the future. It needs to be on the bus line, convenient to the schools and not near the bus depot which is a hub for transients and passengers. It needs to be accessible to the residential neighbourhood which it currently services and which has the highest density of population in the city centre. A new library, as an anchor to the southern part of downtown, and with an ingress to the downtown core is the ideal spot for a relocation. Anything less would be self serving and a ploy by the city to utilize existing, but conficting spaces which will not be suitable. Selling it out from under this neighbourhood has been disappointing and will be detrimental. There is also a proposed new subdevelopment of condos that was scheduled to be built across the street from the Central Branch, which may now be nixed. This would make it even more unpalatable and an aggravating scenario. City Hall had approved this new build just prior to unloading the news about the Mission’s purchase. That wasn’t friendly, As a neighbourhood resident, I am disappointed that Library board, knowing full well they were selling, didn’t disclose to the developer. Shameful. I would like to address the overall plan to update all library branches. I am a frequent visitor of the central branch because I like movies. In the past I would go to the library to get DVDs. The new version of Bibliocommons is excellent. This is an Ontario wide library search engine. Now I go online, check new dvds and put a hold on them. I save a lot of time by checking on line and picking up after I get an email. What does a future library offer that is different from the past? Perhaps we should ask the community what the community’s vision is. I am very happy with the current setup of the Central Library. You as the board of directors can inform the community in more detail what major improvements a 21th century library will offer. A new building does NOT OFFER ANY IMPROVEMENTS! Well said. What are the plans.? This is a disgrace! The building you currently occupy, constructed for you relatively recently by library bldg. standards, can be adapted to serve your needs for decades to come without undo burden on Windsor taxpayers…its unauthorized ‘sale’ to the Mission smells to high heaven… IT MUST BE STOPPED!…I will pour 100% of my energy to fighting at Council level! existing locations. Divide the responsibilities. Cheaper to add on to existing and revamping. Parking is an issue and anything downtown is a problem. Corner of University & Crawford and put the refurb..street car under shelter in front just blocks from SW&A car barn. Why not the empty lot at the corner of Wyandotte & Victoria. Lots of room for a building(even a 2 storey) plus parking. It’s still on a bus route (Crosstown 2, #3) plus only 2 blocks from Ouellette. Maybe install a Tim Hortons kiosk. Keep it Central, Central! Agree with previous posters about not moving too far from current location. The “cultural hub area” and “Ouellette corridor” options are accessible by bus and may be improvements to the current location. Thanks for asking for our input and good luck with the move WPL Central! The Ouellette Ave corridor is the most accessible by Public transportation and is close to the existing location of the central branch. Do not move too far away from the present location of the Central branch. There is a vacant lot across from the existing library next to the funeral home. Also, maybe purchase that old house with the big lot next to it is a good site. It would not be central if the library moves to Caron Ave. Oullette is on a bus route; good for students and seniors. Definitely not Riverside Drive or Jackson Park. This leaves the Waterworld area or the Ouellette Ave corridor. The Ouellette Ave corridor is the most accessible by Public transportation and is close to the existing location of the central branch. Do not move too far away from the present location of the Central branch. Repurpose an existing building!